In the 1950s Elizabeth Marshall Thomas became one of the first Westerners to live with the Bushmen of the Kalahari desert in Botswana and South-West Africa. 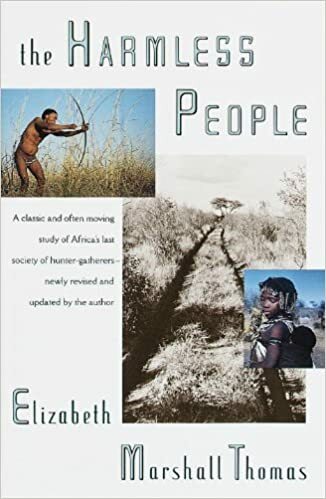 Her account of these nomadic hunter-gatherers, whose way of life had remained unchanged for thousands of years, is a ground-breaking work of anthropology, remarkable not only for its scholarship but for its novelistic grasp of character. On the basis of field trips in the 1980s, Thomas has now updated her book to show what happened to the Bushmen as the tide of industrial civilization -- with its flotsam of property rights, wage labor, and alcohol -- swept over them. The result is a powerful, elegiac look at an endangered culture as well as a provocative critique of our own. "The charm of this book is that the author can so truly convey the strangeness of the desert life in which we perceive human traits as familiar as our own....The Harmless People is a model of exposition: the style very simple and precise, perfectly suited to the neat, even fastidious activities of a people who must make their world out of next to nothing."